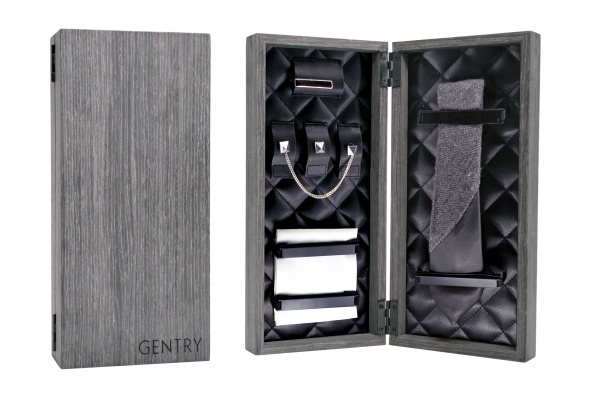 Made directly in Los Angeles, Gentry clothing believes that true beauty lies in the details. Hence, the dressy wear label has turned us on to their Holiday ‘Williams Collection’ for 2011. Several pieces of formal gear, make up the line of event and gift worthy items. Expect numerous suiting options, formal tuxedos and accessories galore. The fist thing we’re showcasing is, this very dark and dare I say “rock n roll” inspired gift set. Complete with studded tie pins, a tweed and leather tie, hardware and several two-tone nuances, this just might be the ideal gift, for that guitar wielding cousin of yours. Watch for more of the Gentry, ‘Williams’ collection this week on Suitored. This entry was posted in Accessories, Cufflinks, Ties and tagged Gentry Holiday, Holiday Collection, Los Angeles. Bookmark the permalink.